Once you have created your Yahoo Mail account, you will want to regularly check for new emails; short of setting up Yahoo Mail in an email program, and using its new mail notification system, this tutorial will explain how to check Yahoo or Yahoo Mail for new emails. We will show you three ways to check for new emails: from the main Yahoo homepage, from My Yahoo (custom, free homepage service), and from Yahoo Mail itself. 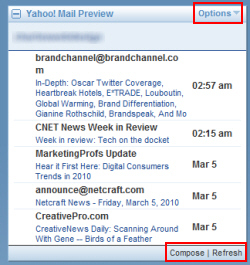 We'll also show you how to customize the Yahoo Mail Preview tool in My Yahoo. This tutorial assumes that you are logged in to your Yahoo account, which can be done by making Yahoo remember you in the sign in form. For more information, please see our Yahoo Mail login and sign in settings tutorial. This is the quickest way to check for emails from the Yahoo homepage! If you are using the My Yahoo homepage service, you will be able to do even better, and actually have a new mail preview right inside the page, no click required! If needed, go to my.yahoo.com (and log in). Then, click on the Add Content button. By default, the Yahoo Mail Preview application only shows you the 5 most recent emails from your inbox, but this can be changed: click on the Options menu, and choose Settings; then, select the number of new emails My Yahoo should show (5, 10, 15, or 20), and click Save. When you move your mouse above one of the emails, a more detailed preview pops up, and lets you Read the complete email in a new window, or Reply to the email in question. Finally, notice that the bottom right corner of the Yahoo Mail Preview block contains a Compose button (to create new emails directly from My Yahoo), and a Refresh button, to check and load new emails from the server. Finally, if you are already inside Yahoo Mail, you do not need to refresh the entire web page to check for new mail on the server (this will reload your inbox and download any new emails, but uselessly takes much longer than the alternative). Simply click on the Check Mail button near the top left corner of the window. This immediately brings you to your Yahoo Mail inbox (if you were in another email folder), and downloads any new email messages from the server. If you have setup multiple email accounts inside Yahoo Mail, you can use the dropdown arrow of the Check Mail button to selectively check emails from a single email account.